Hola Mohalla or Hola Mahalla or simply Hola is a Sikh festival that takes place on the first of the lunar month of Chet which usually falls in March. This, by a tradition estabished by Guru Gobind Singh, follows the Hindu festival of Holi by one day; Hola is the masculine form of the feminine sounding Holi. The word "Mohalla" is derived from the Arabic root hal (alighting, descending) and is a Punjabi word that implies an organized procession in the form of an army column. 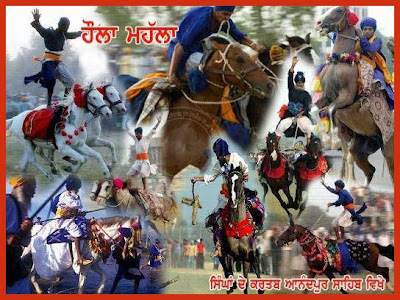 But unlike Holi, when people playfully sprinkle colored powder, dry or mixed in water, on each other, the Guru made Hola Mohalla an occasion for the Sikhs to demonstrate their martial skills in simulated battles. Together the words "Hola Mohalla" stands for "mock fight". 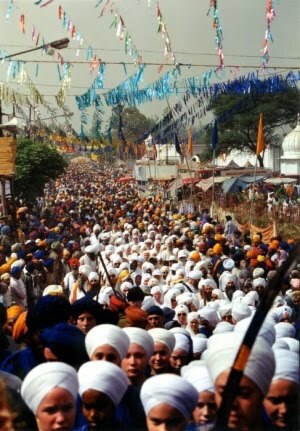 During this festival, processions are organised in the form of army type columns accompanied by war-drums and standard-bearers and proceeding to a given spot or moving in state from one gurdwara to another. The custom originated in the time of Guru Gobind Singh who held the first such mock fight event at Anandpur in February 1701. Originally known as Akalis, the Nihngas or Nihang Singhs are endearingly designated as Guru's Knights or the Guru's beloved. They still carry the military ambience and heroic style that was cultivated during the lifetime of Guru Gobind Singh. Nihangs constitute a distinctive order among the Sikhs and are readily recognized by their dark blue loose apparel and their ample, peaked turbans festooned with quoits, insignia of the Khalsa and rosaries, all made of steel. They are always armed, and are usually seen mounted heavily laden with weapons such as swords, daggers, spears, rifles, shotguns, and pistols. The word Nihang can be traced back to Persian nihang (alligator, sword) or to Sanskrit nishanka (fearless, carefree). In the former sense, it seems to refer to the reckless courage members of this order displayed in battle. In Guru Gobind Singh's writing, Var Sri Bhagauti Ji 47, it is used for swordsmen warriors of the vanguard. Whatever may be the origin the word Nihang, it signifies the characteristic qualities of the clan- their freedom from fear of danger or death, readiness for action and non-attachment to worldly possessions. During the eighteenth century, one of the confederate armies of the Dal Khalsa, constituted of the Nishanvalia misl chief, Naina Singh, whose style of tightly tied tall turban with a dumala gained currency and those who adopted the style were called Akali Nihangs. is a festival celebrated across the northern Indian subcontinent, especially in the Punjab region by the Sikh nation. For the Sikh community this festival commemorates the establishment of the Khalsa. It is also celebrated by Hindus and Buddhists for different reasons. 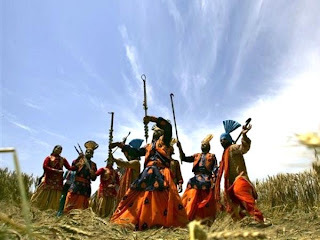 Vaisakhi is usually celebrated on 13 April, and occasionally on 14 April, in the different regions across the world as the Sikhs migrated overseas.